It isn’t long that Toyota filed trademarks for NX 200t and NX 300h and here we a series of models. 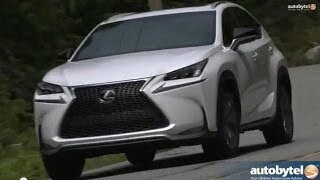 If you have been visiting our website we believe you might be aware about our reviews on NX 200t F Sport and 300h from the house of Lexus. From the same series we’ll be today talking about the Lexus NX 300h F Sport 2014, an impeccable amalgamation of style, comfort and power. Let us have a look at the review of Lexus NX 300h F Sport 2014 to know more. The interior of Lexus NX 300h F Sport 2014 is innovative and stunning with its appearance. Secured with central door locking which is operated by card key, the first thing to grab your attention inside will be leather upholstered seats marking presence and giving comfort in front of leather covered multifunction steering wheel which can be electrically adjusted with tilt adjustment and telescopic adjustment. Dashboard is neatly arranged and the same saga goes with the Center console and center stack as well. The front windows can be electrically operated through one touch for both of them while the rear needs individual keys. Door mirrors are made from carbon-fiber and with integrated indicator lights. For your entertainment you have wide options this includes CD player, radio and Bluetooth connectivity. The entire arena gets more soothing and comfortable with the automatic air conditioning that features two climate control zones. 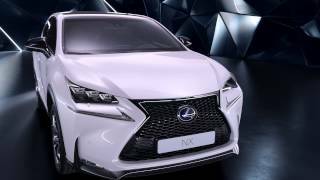 Rounding up the entire interior details of Lexus NX 300h F Sport 2014 we would say it’s comfortable, luxurious, spacious and innovative. The exterior of Lexus NX 300h F Sport 2014 is truly gorgeous beyond any scale of comparison. Starting with the front end of compact crossover you’ll notice the massive spindle grille sitting right over the nose amidst the sleek new headlights sitting over LED accents. Looking from the sides, swooping roofline and wide rear wheel arches covering the massive wheels just in the perfect manner will amaze you with the aggression and sportiness they are splattering. Marching towards the rear you have elongated taillights sitting marking their way till the trunk lid while the bumper sitting beneath gets bit of aggression through the newly introduced exhaust tip. 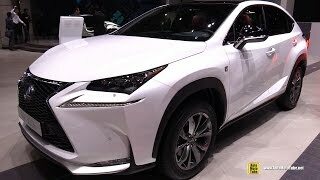 Rounding up the entire exterior details of Lexus NX 300h F Sport 2014 we would say, it’s simply awesome and we hope that Lexus keeps this kind of work rolling. Beneath the hood of Lexus NX 300h F Sport 2014 you’ll have 2.5 Liter electric engine generating 195 hp and taking this thunderous monster to top speed of 12 mph, while the 0-60 mph sprint gets knocked in 9.2 seconds. The CO2 emissions for Lexus NX 300h F Sport stand at 121 g/km while the fuel economy comes to 54 mpg.